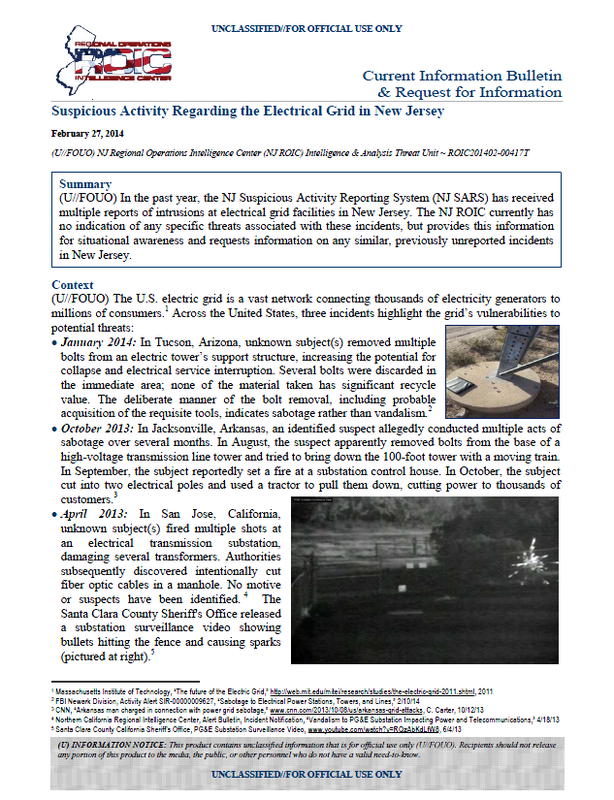 (U//FOUO) In the past year, the NJ Suspicious Activity Reporting System (NJ SARS) has received multiple reports of intrusions at electrical grid facilities in New Jersey. The NJ ROIC currently has no indication of any specific threats associated with these incidents, but provides this information for situational awareness and requests information on any similar, previously unreported incidents in New Jersey. January 2014: In Tucson, Arizona, unknown subject(s) removed multiple bolts from an electric tower’s support structure, increasing the potential for collapse and electrical service interruption. Several bolts were discarded in the immediate area; none of the material taken has significant recycle value. The deliberate manner of the bolt removal, including probable acquisition of the requisite tools, indicates sabotage rather than vandalism. October 2013: In Jacksonville, Arkansas, an identified suspect allegedly conducted multiple acts of sabotage over several months. In August, the suspect apparently removed bolts from the base of a high-voltage transmission line tower and tried to bring down the 100-foot tower with a moving train. In September, the subject reportedly set a fire at a substation control house. In October, the subject cut into two electrical poles and used a tractor to pull them down, cutting power to thousands of customers. April 2013: In San Jose, California, unknown subject(s) fired multiple shots at an electrical transmission substation, damaging several transformers. Authorities subsequently discovered intentionally cut fiber optic cables in a manhole. No motive or suspects have been identified. The Santa Clara County Sheriff’s Office released a substation surveillance video showing bullets hitting the fence and causing sparks (pictured at right). (U) Media reports of the San Jose incident indicates that the unknown subject(s) entered an underground vault near the substation to cut fiber optic telecommunication cables. They were cut in a way that made them hard to repair and caused a phone blackout. It likely would have taken more than one person to lift the metal vault cover. The perpetrator(s) reportedly took a position 40 to 60 yards outside the substation fence, beyond the security camera’s view. A surveillance camera recorded a streak of light – possibly a signal from a waved flashlight, followed by muzzle flashes and sparks from bullets hitting the fence. The shooter(s) apparently aimed at the transformers’ oil-filled cooling systems. Riddled with bullet holes, the coolers leaked 52,000 gallons of oil, overheated, causing 17 transformers to crash. Another apparent flashlight signal, also caught on film, marked the end of the attack, which lasted less than an hour. Authorities found more than 100 shell casings from an assault rifle at the scene. January 26, 2014: Employees found a hole, approximately three-foot high by two-foot wide, in the perimeter fence of an electric switching and substation in East Rutherford. January 22, 2014: An identified subject entered a Burlington generating station using false identification. The subject claimed he had a gun (none found) and a bomb (package cleared). January 19, 2014: Employees found a broken door at a Linden generating station. The steel door was pried open, causing a significant bend in the door, but nothing inside appeared to be disturbed. October 30, 2013: Unknown subject(s) breached the main gate of a Burlington switching station and stole approximately 200 feet of commercial grade copper wire, valued at $1,000. October 14, 2013: Unknown subject(s) cut the chain on the front gate of an electric switching and substation in East Rutherford. October 4, 2013: An unidentified white male tried to enter a Cherry Hill substation by climbing the fence. When observed, the individual fled in a white Ford pickup truck. The subject has previously been seen taking items from a dumpster on the property. August 7, 2013: A surveillance camera recorded an unidentified African American male (pictured at right), wearing gloves and carrying wire or bolt cutters at a Jersey City switching station. July 5, 2013: A surveillance camera recorded two unidentified unauthorized African American males entering a Jersey City switching station.